?Rainbow is a Python module designed for two purposes. 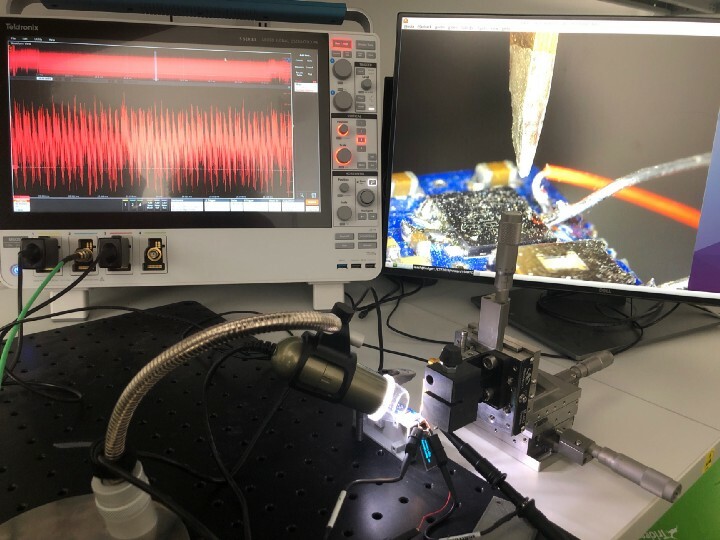 The first one is to help embedded developers test their implementations against basic side-channel attacks (together with our side-channel analysis tool Lascar) and at a later point, against controlled fault injection as well. The second one is to provide some tools to trace whiteboxed binaries in order to break them, much like Side-Channel Marvels except Rainbow can easily be fed parts of embedded binaries. Embedded devices are flourishing with vulnerabilities everywhere and this will continue to only get worse as the number of uses for those grow. Besides the now common software vulnerabilities one should take care of when developing for embedded devices, there are also physical attacks which come into play. Side-channel attacks attempt to retrieve secret keys using power or electromagnetic emanations. 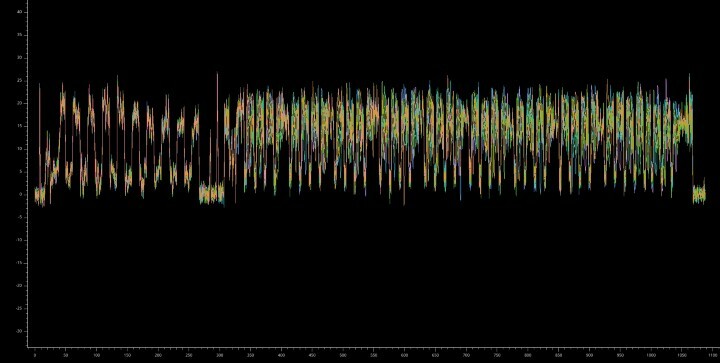 Fault injections use laser or electromagnetic pulses, as well as clock and voltage glitching to change the behaviour of the code running on the device at specific points. A PIN code comparison is blocking an attacker from accessing your data? An attacker can submit a random PIN code and skip the comparison entirely. The state of affairs of embedded development is not ideal. There are no tools widely available to test against those attacks at the development stage (contrary to when the product is finished) and that do not involve having to purchase or rent expensive equipment (oscilloscopes, probes, laser, …) and requiring expertise. The REASSURE project did provide an emulator for Cortex-M0 specifically, but we would like to take things a bit further in terms of tooling and provide something more generic. There was also a suggestion and some draft scripts to achieve side-channel tracing and fault injection with the Unicorn engine (the same tool Rainbow is based on), back in 2015, but this was left as a drafted piece of code in an appendix. 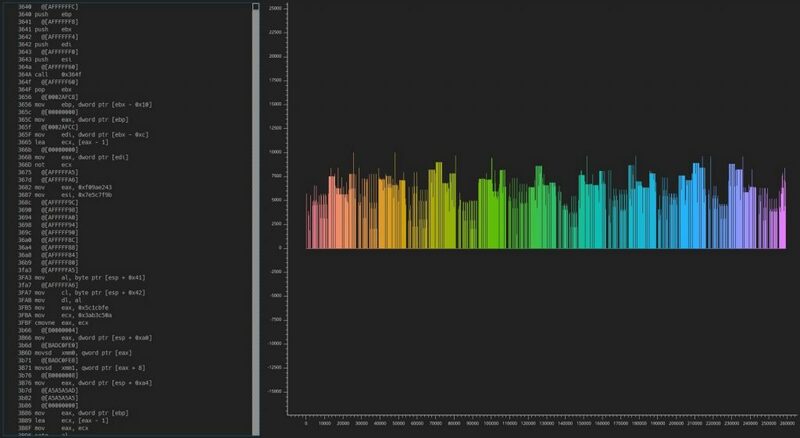 This is why we built Rainbow: we needed a tool to easily and quickly verify the effectiveness of some countermeasures that would otherwise require hard-to-setup real-world attacks. 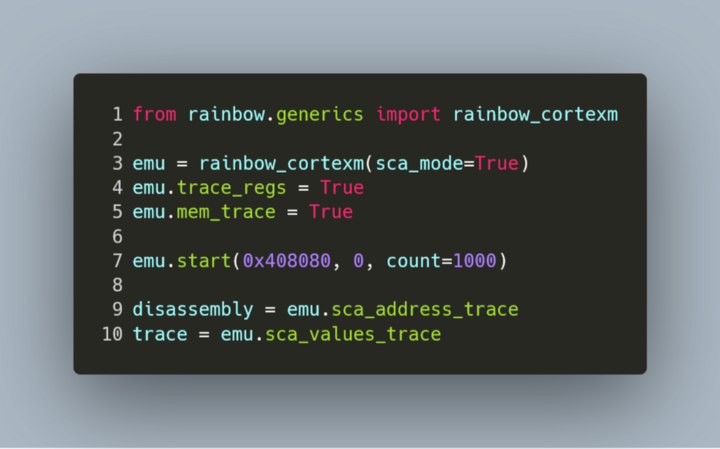 This tool is built on the Unicorn Engine which allows emulating code snippets for several CPU targets: x86, x86_64, ARM, M68k, … Using the right set of code instrumentation primitives or ‘hooks’, we can extract intermediate data from registers or memory accesses dynamically during execution. This enables simulation of a side-channel leakage: the user provides an input to the emulated function, and the tool leaks the intermediate values during the execution. You simply might not have access to the source code! As for fault injection, one can force the execution to skip an instruction in many ways, or use Unicorn’s hooks to execute a very specific value into a register, and check how the code behaves. The tool was made as architecture-agnostic as possible, meaning the tracing behaves the same whether it emulates an x86 CPU or an ARM Cortex one. Capstone is used to detect what registers are affected by an instruction, so that we can precisely select what to leak for each instruction, independently of the CPU. Another important step was to provide basic functions to load common binaries encountered in embedded development: raw binary files, ELF and Intel Hex formats are all easily loaded into the emulator in a single command. Here are some of the basic features of Rainbow and how they were implemented. The function mem_hook will be called on every instruction that performs a memory read or write. 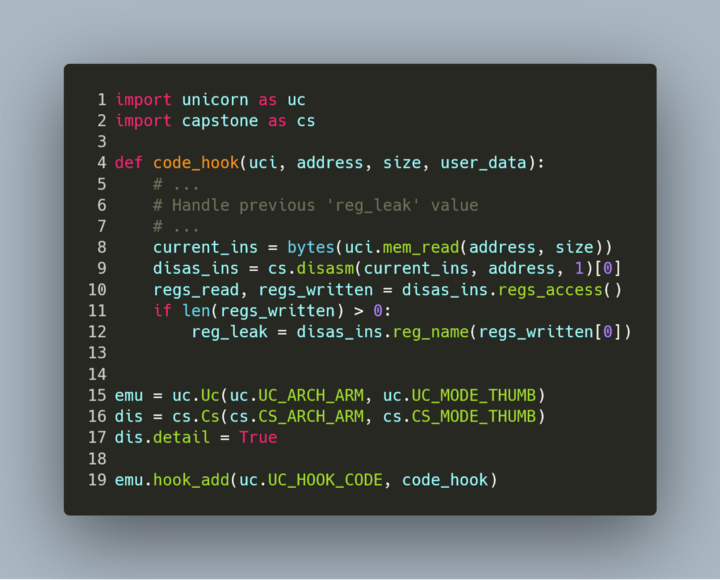 Inside this function, we append either the value that is going to be written, or the value that is read (which we have to read manually from the address provided by Unicorn). We chose to implement something that traces any register move. This time we need a CODE hook which will be called on every instruction just before executing. To determine which registers will be affected, we use Capstone version 4’s regs_access() API. We disassemble the current instruction and retrieve the registers that it implicitly and explicitly writes to. For example, ldr r0, [sp, #8] will modify r0 only. As this hook is called before executing, we defer the reading of the leaked register to the next time the hook is called (which is the following instruction). The tool was designed originally for our own use, which includes testing on Secure Elements. That means we need to develop a tracer based on a generic ARM tracer for example, and add in peripheral simulation easily as well as special register naming in the case of debug traces. Again, Unicorn’s hooks allow this rather seamlessly. Our tool was built with this in mind, so that it only needs very little work to produce a tracer for a whole new device with its own memory mapping, peripherals, and so on. A simple example is adding a hook on a True Random Number Generator. We can do this one of two ways. Either we know that the code will get its random values from some self-contained function and we can hook this, or we know the TRNG register’s address and can write to it just before it is read. Hooking or redefining a function is directly handled in Rainbow. Function names and addresses are loaded together with the binary in the case of ELF files and there is an internal dictionary mapping function names to Python functions that can be passed to the Rainbow instance. Some code block hook (called everytime the code jumps) will perform a check when entering a function whether its name also points to a user function or not. If it does, the execution is redirected to the user function and can return to the original function — acting as a prolog — or return to the caller. It is simply a memory read hook that is active only on this particular address. It is called just before Unicorn actually executes the instruction, so the hook function writes directly in the register and it will be read by the emulated code when the hook is exited. There is a viewer based on VisPy embedded with our code, accessible under rainbow.utils.plot. Using this we can pinpoint exactly what instruction leaks and how much. Once we gather several traces of the same function with different inputs, we can use Lascar to attack it and try to retrieve the key. Let’s attack the AES’s sbox output in the first round on this implementation. 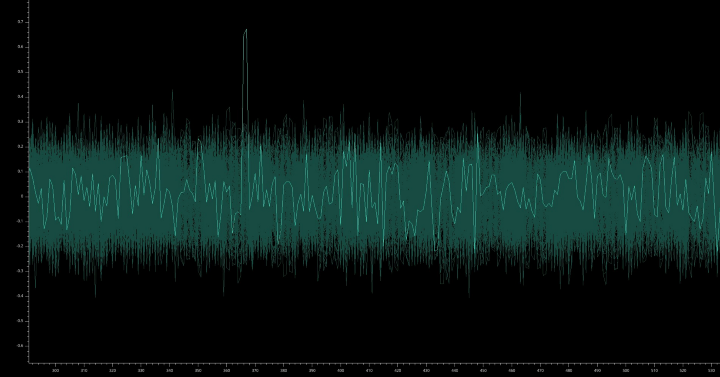 There is a clear spike associated to the expected key byte: it’s easily breakable! This is not unexpected as the AES we used for this demo is not protected against side-channels (although you can find one in the same github repo). There is no fault injection example available yet, though we do have some of them ready. Making a nice interface for fault injection is one of the next tasks before publishing them. There are also more convincing examples of embedded side-channel tests that we will publish as soon as we’re allowed to! Thanks to Charles Guillemet, Pierre O, and Ledger.